Enesco continues to celebrate the greatness that was The Disney Afternoon! If you grew up in the ‘90s like The Blot then you were glued to your television every weekday afternoon watching awesome Disney cartoons like DuckTales, Chip ‘n Dale Rescue Rangers, TaleSpin and of course, Darkwing Duck! A spin-off of DuckTales, Darkwing Duck featured the titular hero battling criminals and supervillains to protect the city of St. Canard. 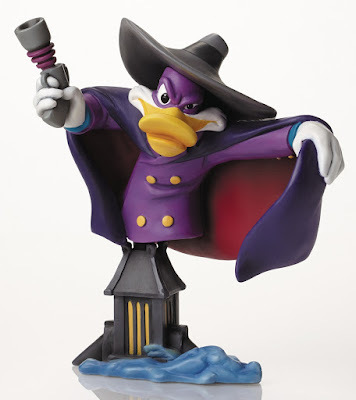 And now Darkwing Duck can protect your toy shelves as a collectible Grand Jester Disney Mini Bust! The Darkwing Duck Grand Jester Disney Mini Bust stands 7.5” tall and 6.25” wide, and is made of stone resin. Collectors can purchase this awesome statue now at Entertainment Earth for $74.99 here.